On the heels of a great Flag Day Event, several productive lobby days on the Hill, new cosponsors to both the Senate and House Statehood bills, and the Senate Majority Leader’s clear call for DC Statehood we’re gathering again on July 4th at 11am to continue the momentum for statehood. We’ll be joining with our friends and neighbors around the city to march for statehood in the annual Palisades Parade. 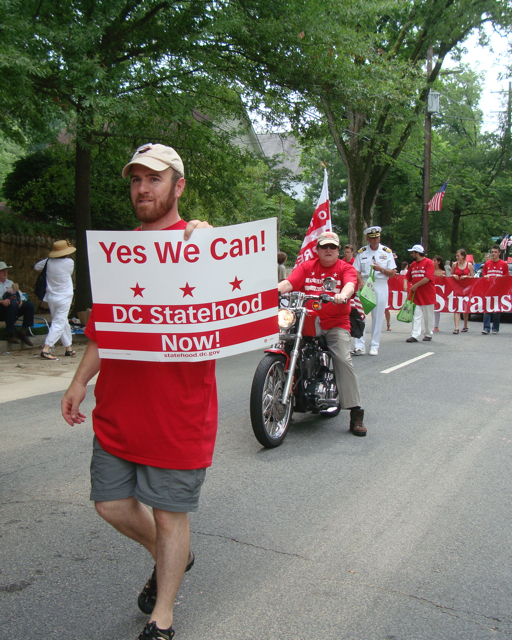 Over the last several years the DC Statehood Coalition has marched in the Palisades Parade on the 4th of July, and we at Neighbors United for DC Statehood have marched with them and will do it again this year. The Palisades Parade is a great DC event and it’s an event where we need to send a clear signal (and have fun while doing it) to the rest of the city that we are united for DC Statehood. It’s a great parade, great community event, and well worth our time to join in. This year the Coalition is looking to have folks from all 8 Wards walking together showing clearly that we’re united for statehood. I hope we can have big turnout from our group members at the parade. RSVP at http://statehoodpalisadesparade.eventbrite.com/ and on Facebook https://www.facebook.com/events/377183659048103/ and invite friends. Hope to see you in Palisades on July 4th to celebrate American independence and to advocate for our equal inclusion in the United States of America.